A lean project management software that provides work visualization, real-time team collaboration, time tracking, and analytics. The best kanban flow experience, and flexible enough to do just about anything! Pros: KanbanFlow is an amazing piece of software, and truly flexible for whatever you need it for. It allows you to visually manage any process, but our company uses it most heavily to monitor our WIP (work in progress) and to manage tasks across multiple users. This allows us to take a quick snapshot of what's being worked on now, what needs to be done today/this week/this month. It also allows us to create an overall work flow ranging from this minute to strategy coming in the next months. 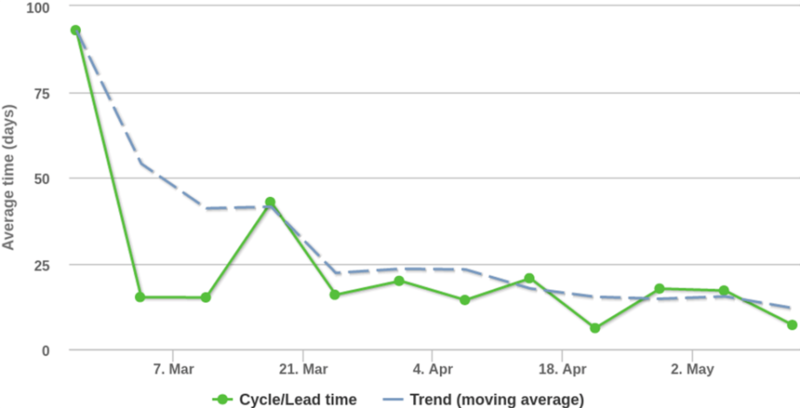 We have also used it to track deals in our pipeline but we ultimately switched that to Hubspot CRM because that includes deal values and forecasting while still retaining the Kanban Board aspect. 1) You can assign your pomodoro timer to specific tasks, so it's incredibly easy to later look back and see I spent 5 hours 20 minutes on this task. 2) You can look at your pomodoro statistics. I have no idea how much work I did today until I look at my pomodoro statistics and compare them to how well I normally do. Cons: Nothing really, it does its job well. I do wish it had a mobile app instead of just a web interface, would encourage me to use it more on my phone. 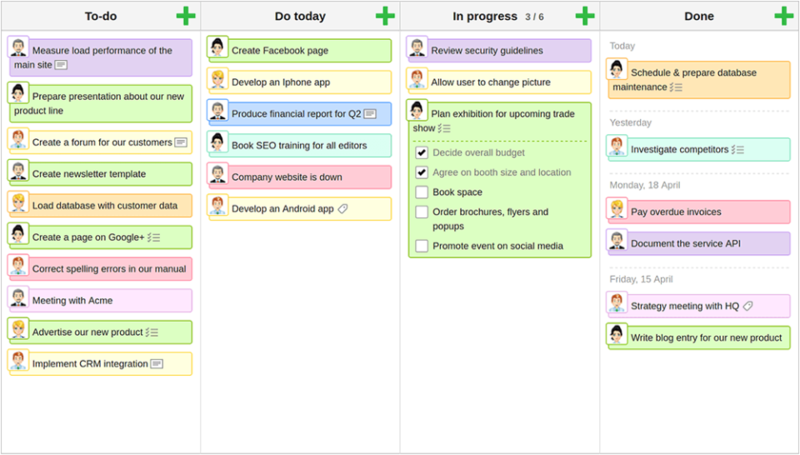 Overall: This is the best way to visualize tasks and manage work flow. By having an ongoing list in things to do today, any of my team members can go in and pull a task into "Doing Now" - that + pomodoro timers that assign to each task means I can literally see where all the time in my day goes, and visually see how things are moving through the pipeline. Pros: Easy to use and fast. Setting up a board, adding entries to it, moving them around, is incredibly easy, intuitive, and fast. Cons: Adding labels is a little slow. I wish I could add labels to cards more quickly and easily. As a result, I don't use the labelling feature much. Overall: I have so far only used the free version, but I have thought many times I should buy the premium version if for no other reason than to support this great company and product. But with the free version I have all I need. I just use this for personal use. Where I currently work, they're already invested in Atlassian JIRA, so I can't influence them to purchase KanbanFlow, but if I am ever at another company or job where it comes up, I would enthusiastically recommend KanbanFlow. (Because compared to JIRA, KanbanFlow is so much easier and faster to use). I use this to track my Personal To-Do's and to track my Work To-Do's. I'm a software developer and when I get hot and heavy on a large complex project, I break down the work into tasks on cards, and it helps me organize and focus so much more. It's very easy to set up a board and add cards to it. I use the subtask checklist a lot, and I sometimes use the color coding too. It's so easy to move cards around the board. I haven't needed or tried to track history on a card, or track time, but those features (especially the time) seem to be available. The mobile website is great too, and I am able to move cards around or add/edit cards using chrome browser on my andriod phone, and it works surprisingly well. - It's (paid) analytics feature does provide valuable management information. - Does not allow for on-premises installation, all information is stored on their own servers/cloud. - Workflow customizations are not possible. Overall: We've used this tool (both the free variant and paid subscription) for managing multiple projects in the past. The software is extremely user friendly and everyone from developers to clients loved it. KanbanFlow is heavily oriented on managing large numbers of concurrent work-in-progress tasks (Kanban), so it's dashboard is a collection of swim-lanes depicting the current progress. It allows for registering individual user accounts and assigning these to Agile boards. The developers loved it as it is extremely simple to create a task, to update it's status or to record work. The management & clients liked that they got an easy overview of everything that was getting worked on. The paid subscription, while adding additional functionality and removing some of the limitations, is mostly focused on reports creation and task analytics - the latter was especially appreciated since it makes it easy to highlight time-hogging stories or tasks. Cons: *Doesn't allow me to remove the colors I'm not using on the bottom legend without entering the settings menu. Just a little detail that could be easily implemented. *There's no role in the boards that allowd users to only see it without editing rights. I guess it's linked to the concept of the metodology but it's been needed in a few opportunities. 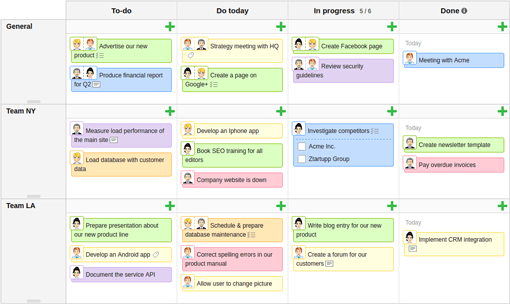 Overall: KanbanFlow helped us organize a large set of tasks for a team of 19 people. Management also was able to create their own boards so we can keep track of different situations and on different levels. We never encountered problems setting up accounts and the site is always available and stable. We would be lost without it at this point! Users can activate e-mail notifications when a task is assigned to them which is useful if you ever have a reluctant users that says too much "I wasn't checking the board during the day". Pros: All the basics of Kanban are available in the free tier. For a freelancer working with a single client, as I've done in the past, the free tier is probably all you need to get things done. 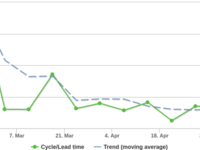 I used Kanban Flow extensively for about 20 client projects, and then started using Slack. I've recently come back to KF, however, because it's much easier to stay focused and see how far you need to go to finish. Free tier includes unlimited boards, and that's awesome. The webapp is wicked fast on Chrome. I mean really really fast. Premium tier is fairly priced. The app gets lots of attention from devs and is updated frequently. Cons: Administration of boards is a bit tedious, requiring several clicks, and then clicks back to start over with a fresh board. I can't find any way to increase the font size, other than zoom in Chrome. Advanced functionality isn't free, and I imagine if you're a business with more than a couple team members, you'll need the premium tier. Pros: These are based on the free version. * Can be shared with other users. Cons: These cons are limited to the free version. * Different colors are offered but the options are limited. * The default "In Progress" section always expands each task automatically when you first sign on or refresh the page. * Reports aren't available if you don't use pomodoro (there is a log though that shows up to the past 14 days). * I tend to end up only using the "In Progress" column as a running to-do list. * Can't attach files in the free version. * It'd be nice if we could add sub-sub tasks. 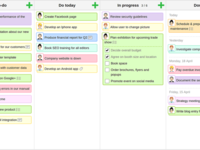 Overall: Planning vertically (aka using a vertical list) seems to work better for me so I was glad to be introduced to Kanban Flow, and that they offer a permanent free version since, at first, I just wanted to test it out -- I've been using it ever since. Recommendations to other buyers: If you're looking for something simple to act as a type of to-do list then give the free version a try. If you like to color code then try using the limited amount of colors offered in the free version, it is a convenient way of managing priorities. Great and easy-to-use software that helps me stay organized at work every day. Pros: I love the simplicity of the design and how easy it is to use overall. It is exactly what I would expect from a software that helps me be productive and keep my workflow organized. It's incredibly easy and convenient to quickly add a tasks or reminder, even on the busiest of days, so it won't slip your mind. And I love the flow of columns you can move your tasks through as you're trying to get things done. Cons: I think the actual design is a bit dated, I just don't love the look of the software as much compared to what else is out there. Overall: It helps me stay very organized and on top of things with big and little tasks at work. Whenever I remember something that I still have to do I'll just quickly add a reminder or task for myself or the team in the appropriate column. That way I never forget anything I have to do and stay productive. Pros: Setting up the boards and using them is extremely easy to do. I have used it for client work - to keep track of the time I have spend on each aspect of each project and this has been very useful for that. Cons: I am working with the free version - and so this might be available in the pro - but I would really like to have my tasks auto populate onto my MacBook calendar so I can coordinate tasks with meetings and the rest of my planning. Pros: It is simple to use. My favorite part is the built-in timer on the bottom left. This is great for pomodoro time management. Cons: You can add a checklist to a kanban card but you can't put subchecklists inside of a checkbox. I often like to break out complex tasks with further levels of detail and this would be a nice way to do it. Overall: It has been my personal and work task list for the last few years. It has been very useful at keeping me organized and focused. 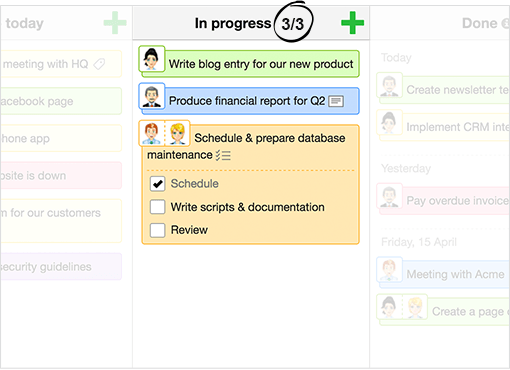 Pros: Compared to other kanban software, this one is really simple and easy to use. Get rid of the sticky notes on a whiteboard and use this instead! Very easy learn and start using. I used the free version, which was great for my needs. However, you can also go on subscription to get the full raft of available features. Cons: If you are looking for a kanban with lots and lots of features, you may find kanbanflow a bit lacking. It's real strength is its straightforward and easy-to-use design. 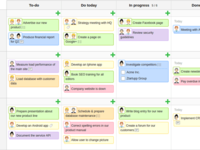 Overall: I wanted to experiment with kanban task boards, and this was a great initial platform. I have since moved on to using another product with more features, but kanbanflow is definitely worth looking into for a basic, easy-to-use solution. Pros: I liked the pomodoro timer as well as the simple layout. Cons: Completed recurring tasks get put immediately back onto the board. Would love the option to hide them until near the time it recurs. Overall: I am using this now as my full-time task manager. It does two things very well: simply lays out all of your cards, and allows you to time your work on each of your tasks. I like that the pomodoro timer isn't "fake". It is tied to whatever task you are working on, and you can easily switch tasks mid-pomodoro, and the appropriate time is logged to each task. So at the end of the week I can see by color, by label etc how much time I spent on everything. I only have two minor gripes. One is that the UI is starting to get dated, the other is that recurring tasks show up again after you mark them complete. This is not a bug or anything, its just annoying to see it pop right up again. It feels like I was robbed of my gold star of completion. For now, I have an external system setup instead, on a cron job. So these tasks get posted to the API and show up on the board. Pros: It's free version already comes with valuable functions. It's board view is easy and great to handle project tasks with support to collaboration and time tracking functionalities. Cons: It repeat task functionality could be better, showing just what is next to be done, but it only show all the future tasks, which make some tasks to appear in the wrong time. Pros: This is my favourite Kanban tool. Easy to use and has the ability to easily use from mobile. Thanks to this I do not have to have small tasks to do in my head and motivates me to action. I honestly recommend it as a free tool. Cons: The graphic layout is quite old and we do not have any additional features besides basic ones. Pros: KanbanFlow is easy to use. The UI is easy to look at and the software is easy to learn. The program is pretty simple, yet it's very capable of handling just about anything you throw at it. It also connects to Outlook, which notifies other team members when they have a task due. Cons: It's not pretty. There are other options that are more pleasing to look at, but that should not make you avoid it. Overall: KanbanFlow has helped our team stay on the same page and increased our efficiency, productivity, and communication. Pros: We have been using this to keep our team up to date on where our various projects are progress wise, and make sure everyone knows what they need to do. Cons: It would be nice if there were some charts and reports that could be run like there are in a few alternative tasking apps (like Wrike). However, KanBanFlow has been great. Pros: The customization of columns and colors are perfect. I set each work role as a different color so I can tell at a glace which role a task belongs to. I enjoy dropping things in the Done column. I use this as a communication tool with my supervisor by sharing my board. Overall: By writing down all tasks and color coding them by role, I have learned which things are taking up a lot of my time. I have created columns for "Waiting on Someone Else" and "Redirected From" so I can see where tasks are stalled for reasons beyond my control. Pros: I use KanbanFlow every day to manage my life. It is user friendly and integrates with other products I use like Google Calendar. Cons: User interface isn't particularly attractive. Overall: I work multiple jobs in addition to owning a business. This software helps me manage everything from personal finance to client communications. This is one of the first things I look at every day and love it! Pros: It is very simple, intuitive, and easy to use. Cons: There isn't anything I don't like about this software. Pros: We use the tool frequently to manage team and project tasks, we find the rocccurong task settings really useful for mapping monthly and weekly tasks! You can assign tasks to individuals which can be shared and filtered as needed. The card can list a number of subs tasks making it really clear on track g process as they move across the board swim lanes. Cons: The tool almost has too many feature making it more complicated then it needs to be. Maybe if there were more intervention with time sheeting or scheduling we would get more more use of the tool. Overall: Overall the use of kanban boards has given us a great start in organising outlet workloads equally and providing individual and team accountability. It's a great tool as a starter but need to as you would expect be used along side other applications. Excellent task management for busy people! Pros: My favorite thing about Kanban Flow is the Pomodoro Timer. It keeps me focused and on task. It allows me to work in sprints and knock a bunch of tasks off my list - it's a fantastic productivity tool. Cons: The version I use isn't as nice-looking as other tools. 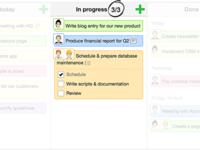 Pros: I love KanbanFlow -- it's a simple and easy design and helps keep me on task! It's the best to-do list I've ever had! Cons: Nothing -- I love KanbanFlow and will continue to use it. Used it to develop a Kanban Board for a software development process. Pros: Easy to use. Demo version allowed for proof of concept in one day. Provided a number of fields that fit directly to our requirements. Cons: It would have been nice to have the ability to rename certain fields to suit our local conventions and names. Also, there is some difficulty deleting values from selected fields. Overall: Solved our problem at very low cost. Pros: This is the single best software that has improved my organizational abilities and keeps me on task. It allows me to see a visual representation of what needs to be done and what's been completed in a visual manner that easy to understand. Cons: Not sure because I use the free version of hte software, but it would be great to have more colors to identify categories. Overall: This software keeps my personal and professional life organized. Not only myself but for my team members. Pros: I love this software. It is easy to learn and use! Overall: Overall I LOVE this software and will continue to use it for years. Cons: I think the price is a little high for what this software can offer. I feel like its a little to limited on what it can do, I think its a great idea that they could take further to incorporate more of like a to-do list feel. 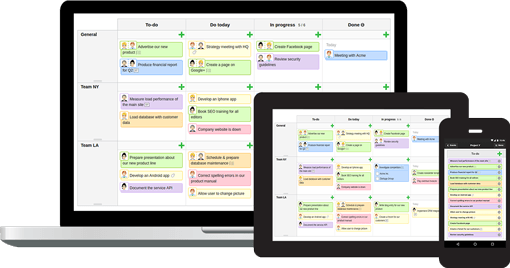 Overall: Very good project management software. 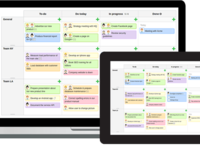 Comments: I had been using online Kanban tools for project and task management among different teams in my organization for last several months and things were going well but the problem I had been facing was the lack of Timeboxing. I explored and studied about the Pomodoro technique and Flow. After reading through it and downloading a few nice Pomodoro timer applications, I realized that an integration of Kanban and Pomodoro could be good combination to get the tasks done in timely manner. I wished there had been a tool available with both techniques combined and luckily I found KanbanFlow, a perfect combination of Kanban and Pomodoro tools. I have started using it and going to implement in my organization very soon. Although it's a very nice tool but there's always a room for improvement. The user interface design can be improved to match some other similar tools and few other features can also be added. A native mobile app along with Pomodoro timer would add a great value to it. I wanted to give 4.75 but as it accepts only whole numbers so I am rounding it off to 5. Pros: So the free version is great. All functions needed for personal Kanban are there. Pros: This is the best solution I've ever seen. Please add multilingual (Russian, Polish). I can help with the translation. Thank you so much! Don't stop! Cons: In the free version, you need to make it available to attach files - at least up to 10 MB. I would like to see a special application for iphone. Pros: Easy to customize, shows me everything on the board, don't have to open another section to see more details. Cons: Ability to select colors for the column HEADER versus the task and more vibrant colors. Just started with the program so I need more time to make additional comments. Overall: I'm able to keep up with my workflow and manage my task better. Pros: It's simpler than Trello and has some features that make it very good to organize all your tasks. It's integrated with pomodoro timer which is great! Strong tool, hopefully they'll keep focusing on new features. Pros: It's easy to use and helps us keep on track. The UX is better than average. There's good control over notifications. Cons: The UI could be improved a lot like in how things are diplayed on the cards. There are design hierarchy issues. Also there are alternatives that offer more features. Adding links, images, attachments etc. involves using markup. It would be so nice to have interface features that allows my to apply text effects more simply like bold, italic or changing color. More text editor tools and being able to attach images or files without using markup would be great. I never love user-based pricing even though so many companies do it. Overall: It's a good tool but could improve the UI and card features with adding images, links, text styles and attachments. There are better alternatives but KanbanFlow could be a great tool if they keep improving. Pros: If you are used to Kanban methodology, this is very straightforward to use. It is a decent project management tool if the team is committed to it. Cons: It seems antiquated. Not very intuitive for first-time users. Some important functionalities like calendar view are hard to find. It is also difficult to direct-message, particularly on mobile devices. Pros: I like that when you use it you can easily move tasks around between the bord section and everyone can do this visually together. Cons: Some of the features are limited when it comes to looking at how much your team is accomplishing and tracking progress. Overall: Good. I think it's a middle of the line product.